Top floor of modern house with views in San Ignacio. - Full kitchen with stove/oven, Keurig coffee maker, toaster, microwave, etc. The property is located on the edge of San Ignacio in the Cayo Vista area. It is a 5 minute drive to downtown/Burns Ave/Farmers Market. It takes approx 25 minutes to walk downtown. The property has amazing views of San Ignacio and the surrounding mountains and is it’s best selling feature! The last 30 seconds of the road coming into the property is rough but does not require a 4x4. All vehicles are capable of reaching the property. Guests will be given a code for the lock box to access the keys anytime after 3pm. Keys are put back in the lockbox upon check-out. There is a 20kw back up generator in case of power outage, so you will never be without power (A/C) during your stay. The bottom level of the house is occupied by the caretakers. They do not intrude on the privacy of guests but are available to answer questions or attend to any needs. We provide linens, towels, toilet paper, paper towels, dish soap, cleaning supplies, coffee, tea, sugar, powdered milk, purified drinking water, shampoo, body soap. The kitchen is stocked with salt, pepper and basic spices, all dishes, cooking utensils and pots/pans. Our property is quiet and peaceful. You will not be kept awake at night by barking dogs or crowing roosters, which are common in the neighbourhoods in San Ignacio. We are truly in a birders paradise. On any given day you will see toucans, parrots, parakeets, vultures, as well as many other tropical birds. We are also close to Cahal Pech Ruins, Rolson’s Cantina, less than 10 minutes drive from Xunantunich Ruins, 4 minutes drive from the Green Iguana Conservation Project, and the Princess Casino. Guests would benefit from having their own vehicle. In case guests do not have a vehicle we can provide recommendations for shuttle services. We can also provide recommendations and phone numbers for local taxis. We also have a guesthouse on the property that is for rent (listing #1187369) or you can rent the guesthouse and main house together (listing #1313124). Belizean/Canadian couple living in San Ignacio, Belize. We love to travel and have set up our vacation rentals just as we would want them if we were the guests! Surrounded by nature, overlooking a pice of San Ignacio - it’s a wonderful spot. A vast array of wild life will keep you entertained, home is very cosy and safe. Would come back in a heart beat. This is a wonderful house. The living area is very large. It could easily accommodate a family, but there is only 1 bedroom. The kitchen is modern and very well equipped. We had hoped to enjoy breakfasts on the deck, but the weather did not cooperate. The road up to the house is very rocky and rough. We quickly discovered a way to miss part of the unpaved road. Then in the instruction book provided by the owners we found there are directions. They will give you the rough road way in your checkin because that road is easier to find, but look in the notebook for the smoother way. The immediate driveway for the house is paved—steep access, but a nice flat area to park. The property is a bit out of the way, but it isn’t far into the main part of town. You are away from the hustle and bustle. The view is very pretty, It is nicely landscaped. There are many things to do in the area. The house was well equipped and as described. The deck was huge and provided a wonderful view of San Ignacio below. Many different types of birds to watch from the deck. The interior was clean and comfortable with a large screen tv with many channels. We are less than a 5 minute drive to Cahal Pech ruins, the Casino, Thirsty Thursday’s and the Green Iguana Conservation Project. 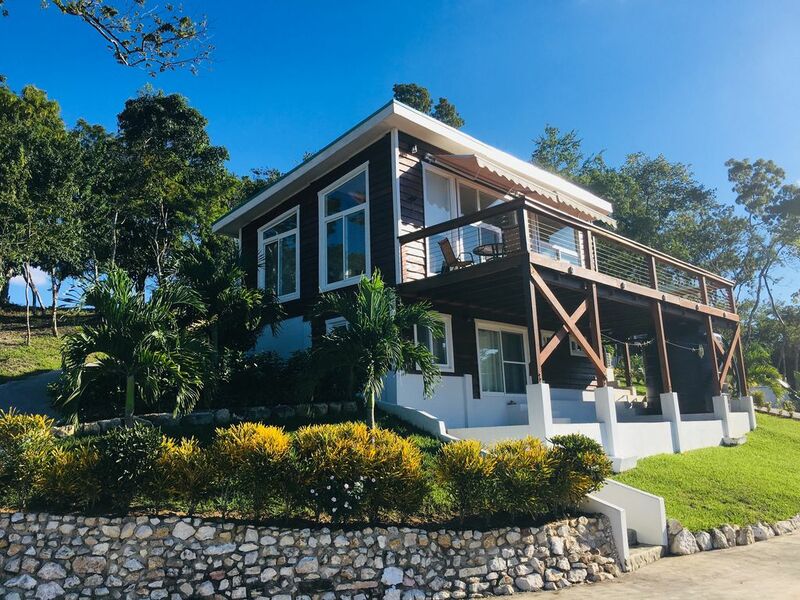 Downtown, Burns Ave and the Farmers Market are about a 5 minute drive away and Xunantunich Ruins are less than 10 minutes drive from the property.